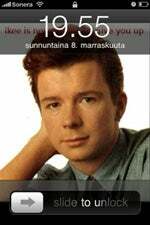 Reports this weekend warned of a number of iPhones in Australia reportedly infected by a worm that only replaces the device's background wallpaper with an image of 80s pop icon Rick Astley. What needs to be stressed, though, is the fact that the ikee worm only affects jailbroken iPhones running the SSH app with the default password, which represents a very small percentage of the total number of iPhones out there. Apple condemns jailbreaking and says that doing so to an iPhone voids the device's warranty. The Cupertino company is cracking down on iPhone jailbreakers, and is already reportedly shipping new jailbreak-proof 3GS models. Apple is also hiring security specialists to tackle to problem, according to reports.